I’ve been a STEM Ambassador since March 2009 and to date have taken part in five activities at four different schools. I became a STEM Ambassador through my professional registration with the Institution of Engineering & Technology. 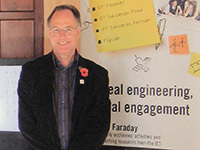 In March of this year I volunteered to become the IET School Liaison Officer for Kent. The IET is fully committed to the enhancement & enrichment of STEM subjects and runs an Education 5-19 Department which publishes magazines for students and teachers; they also provide wall charts, run competitions and have an extensive web site. One of the conditions of being a School Liaison Officer is that one becomes a STEM Ambassador. STEM Ambassadors come in all shapes and sizes of experience ranging from Apprentices through to Managing Directors of Companies. Each STEM Ambassador undertakes an Induction Session that provides a background to school organisation and the education system, together with providing guidance of how to approach being an Ambassador. Before being let loose each Ambassador is subject to a CRB check. On my induction session I met some very interesting people, including a forensic chemist and a graduate engineer at a power station. For myself I bring some 40 years experience in telecommunications engineering, where I started as a technician apprentice and recently retired as an engineering programme manager running a series projects within a multi-million pound budget. The Ambassador events that I have covered so far are a Science Fairs where 2500 primary school children from 45 schools attending over 3 days. I have also spoken at Careers Events with a presentation I have prepared called “Engineers Don’t Stand Still”. The theme of this talk is that to be an engineer takes one into a career of continuous change and endless opportunities. I do draw the distinction between engineers and technicians. Where, engineers are innovators, who create, design, plan, manage and deliver change. I have also spoken to the whole of a year 12 at one school as part of the PSHE lesson. I know that other Ambassadors help at Science and Engineering Clubs, give advice on special projects or give demonstrations in the class room. The benefit that Ambassadors can bring is that they are an unfamiliar face (not the parent or teacher) who can bring experience of the work environment into the class room. Ambassadors can also give 1-1 mentoring or can provide industrial resources or know how in the class room. "Each STEM Ambassador undertakes an Induction Session that provides a background to school organisation and the education system, together with providing guidance of how to approach being an Ambassador."